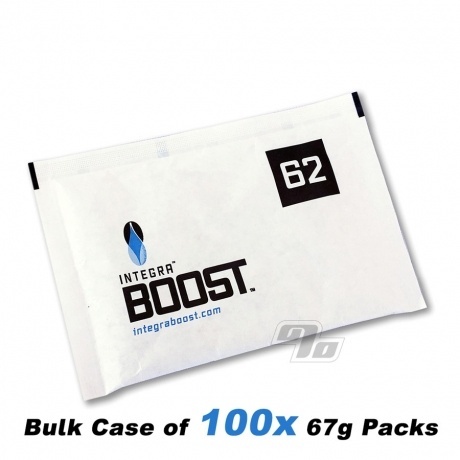 These large 67 gram packs of Integra BOOST are tuned to an herb perfect 62% humidity. Now available in Case quantities of 100 packs. Do you have 100 lbs of herbs to keep fresh? We have the Boost for you. Boost utilizes a patent pending 2-way humidity control technology to eliminate the humidity spikes and even the slightest fluctuations in humidity, preventing your herbs from losing any oils, character or flavor. Perfect for transport and long term storage post cure/dry. Great for big glass jars on the shelves or transporting. The Integra BOOST is an entirely salt-free solution unlike Boveda. No chemicals and all ingredients are food grade approved. Even the paper packaging is food safe. Who really wants a dirty manhandled pack sitting up against their fresh herbs? 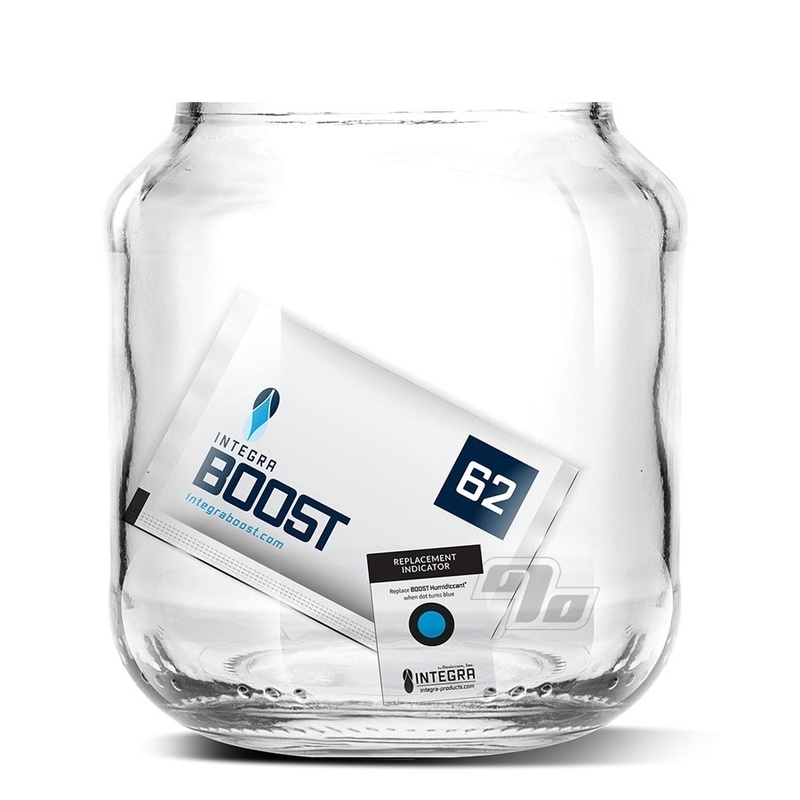 Each individually sealed Integra BOOST pack includes a Humidity Indicator Card so you always know when you need a fresh pack, ensuring freshness and aroma is always maintained. Place it against the side of your jar and no need to open and check. Keep it sealed! If you're storing or transporting ~1 pound bags then this is the pack for you. Boveda humidity packs not only harden up but can impart an odor as well. Don't risk it on the big stash. How Do I Know When to Replace My Boost? Every Boost pack includes a Replacement Indicator Card. The Replacement Indicator Card allows you to know when it's time to replace your pack, without having to dump out your flowers. When the dot turns vibrant blue, it's time to replace. Integra Boost eliminates the guessing game! How Do I Read the Replacement Indicator Card? The cards used with 62% Boost will have a pink dot. Regulating occurs when new air is introduced. Seal the lid and dot will slowly react to humidity. The dot will turn blue, when it’s time to replace pack. Keep in mind that the indicator may turn blue at the start but as the humidity adjusts in the new environment it will go back to the correct color until it is actually used up.